One Fat Frog loves it when the restaurants of our beloved clients are successful. It’s always great to hear the success stories and see their names in the news. This week we happened to see Scratch Tapas featured in Orlando Weekly. 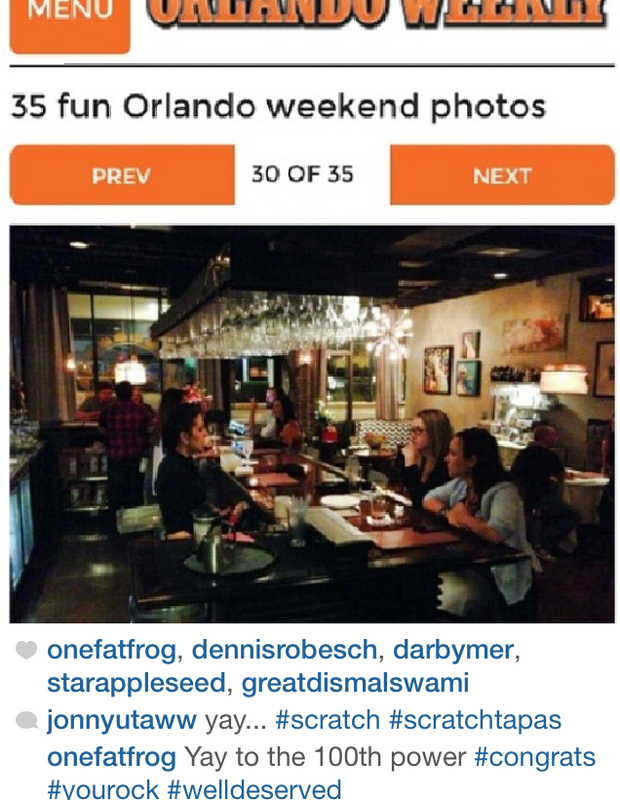 The popular weekly entertainment magazine featured Scratch Tapas in its article for “35 Fun Orlando Weekend Photos.” This was the second time in the last week that the magazine had featured Scratch. This time, they published a photo showing diners enjoying themselves at the classy new Winter Park tapas restaurant. The only thing that would have been better is if the picture was of me eating there, because that means I would have gotten some delicious tapas. Hey Scratch, I’ll let you take my picture for some free tapas! Deal? Scratch Tapas is a modern American tapas restaurant that specializes in microbrews, craft beers, and fine wine in addition to the great food. The full menu is available until close, which is at 2:00 am, so you can’t say it’s too late to get some good food. It wasn’t long ago that the owner of Scratch came into One Fat Frog with a dream, a business plan, and a passion to do what it takes to succeed. Now the restaurant is open and getting featured in the local press. We’ve seen it happen time and time again and honestly, nothing makes us happier. Opening your own restaurant, working for yourself, and doing what you love is the American Dream and right now the folks at Scratch Tapas are living that out. Are you ready to follow suit?